Mapped from DEP Wetlands data: bog, shallow marsh, meadow or fen, deep marsh, shrub swamp, wooded swamp deciduous, wooded swamp coniferous and wooded swamp mixed trees. Wetlands are habitats that occur in areas of relatively low, flat topography and that are saturated or inundated by water long enough in the growing season to cause anaerobic (low oxygen) conditions in the upper part of the soil. These areas are generally characterized by plants that are adapted to grow under low oxygen conditions and soils that display particular color characteristics indicative of anaerobic conditions, such as grey or blue-grey coloring. 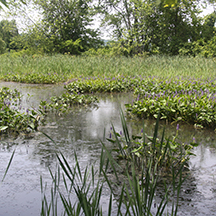 Freshwater wetlands include vernal pools, bogs, fens, wet meadows, marshes, shrub swamps, floodplain forests and other types of forested wetlands.